SAVE 5% ON ALL ORDER OVER £399 - use FIVEROFFER in the Apply Coupon on the basket page! Please fill in the form below and we will do our best to offer you a price match usually within 1 business day. Coco54 work hard to offer the best prices available. If you do manage to find a product cheaper then please let us know and we will match the price. Products must be identical and have to be brand new. Products must also be in stock and for sale by a retailer with a website. Auction sites are not included. If we feel the request does not meet our terms and conditions we will not price match. The 3 Drawer Venetian Mirrored Chest is eye catching yet subtle, ready to easily fit alongside existing decor or as part of a new set. 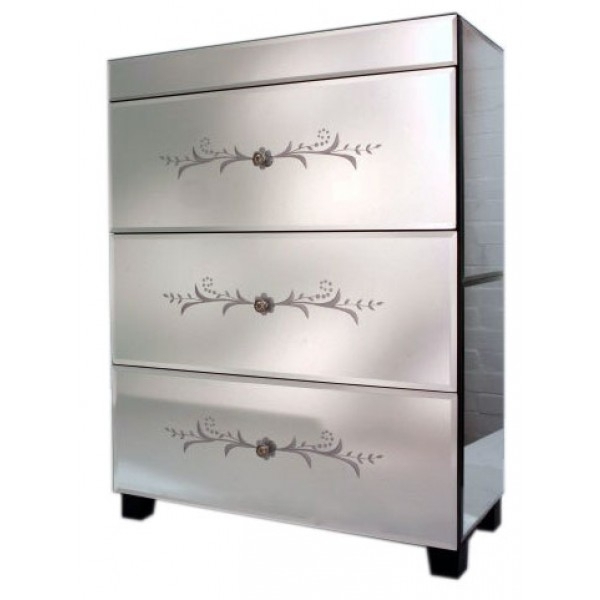 The 3 Drawer Venetian Mirrored Chest is an engaging and enchanting hand crafted piece you won’t regret. Our price includes VAT and Delivery.